Losing a home to foreclosure is a very stressful and discouraging experience which may have a negative influence on one’s desire to own another home. Fortunately, a foreclosure is not the end of the world, and it doesn’t mean that you can never own a home. Depending on the circumstances of your foreclosure, it’s just a matter of time before you will be able to apply for a new mortgage. When Can You Apply for a New Mortgage? Normally, you have to wait seven years after the foreclosure to buy another home. This is the period of time that is required by the government-endorsed organization Fannie Mae, a company that has purchased a large number of mortgages in the United States. The foreclosure remains on your credit report for seven years, but even after that you will need a good credit score in order to secure another mortgage loan. If your foreclosure was caused by extenuating circumstances, like losing your job, a significant pay decrease, or illness, the period of time before you can reapply for a mortgage loan is reduced to three years. Extenuating circumstances are events that are beyond your control and must be properly documented. Another possibility is that some lenders will be willing to give you a new mortgage loan right away. Unfortunately, the new mortgage loan will probably require you to pay a very large down payment and high interest rates. Defaulting on your mortgage will have serious repercussions on your credit score. The foreclosure will show up on your credit report for seven years, but you should start rebuilding your credit score right away. If the foreclosure is the only negative event on your credit report, then you can rehabilitate your credit score in as little as two years. In order to start increasing your credit score you will need a credit card that you will use to pay for your purchases. On-time payments will reflect on your credit report when the time to apply for a new mortgage loan comes. It is important to make sure that all three credit agencies record your payments on a monthly basis. The housing market crash has left many Americans with no other options than finding a place to rent. Fortunately, recovering from a foreclosure is not as hard as it seems, it just takes a while. Rebuilding your credit and regaining the lenders’ trust can help you get a new mortgage loan in only a few years. 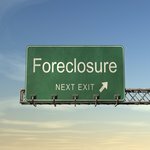 Foreclosure is a scary and depressing process, but, through a little research and a lot of determination, you can quickly get back on track and become a home owner again.